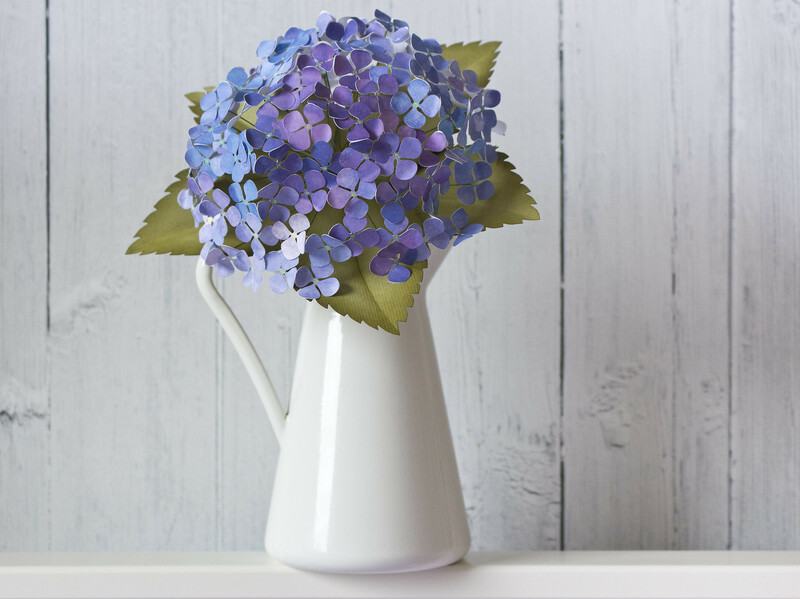 Do you have a favourite flower? I’m not entirely sure that I do, but these last few years I have favoured big, flouncy blooms, and things like peonies and hydrangeas have been high on my list of ones I’d love to have gracing my imaginary country kitchen. But like my large, spacious kitchen, the flowers have failed to materialise. 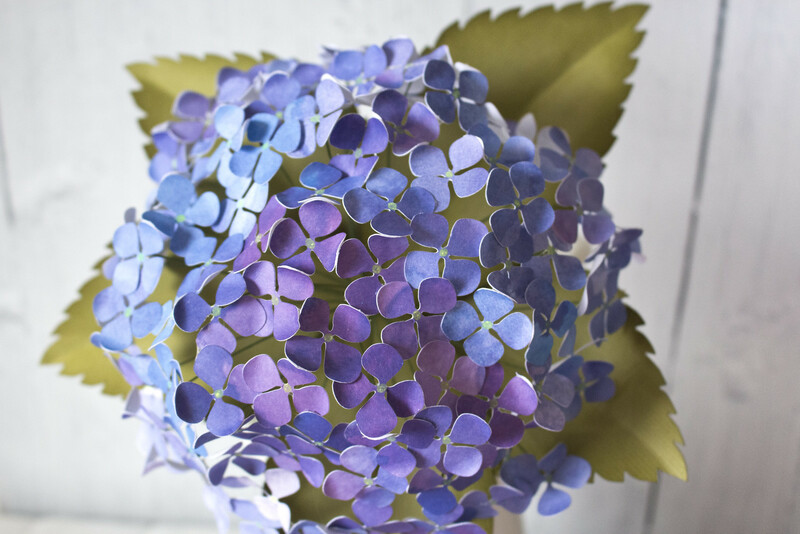 I rarely have fresh flowers, and have never seen either peonies or hydrangeas for sale, so when I made some flowers for a paper Spring Wreath recently, I decided that I was also going to try to make a paper hydrangea. 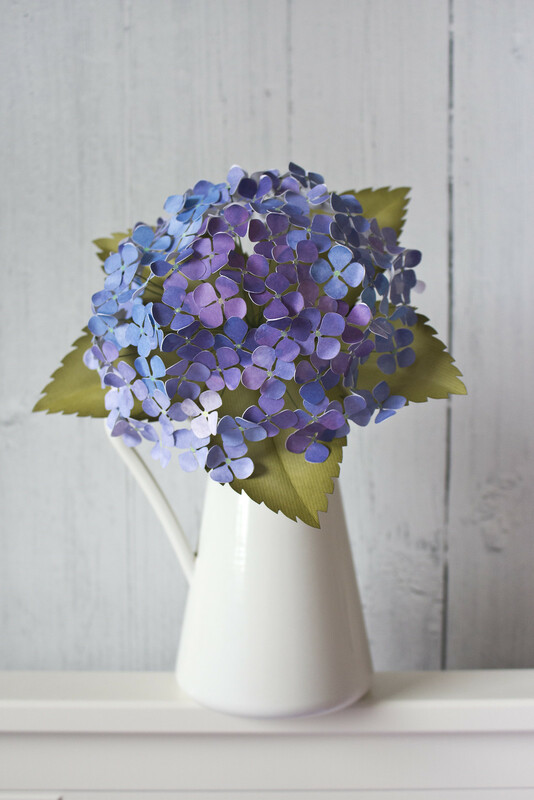 Making the hydrangea was not for the faint-hearted, which is kind of ironic if you have been following my recent health issues, but though it was time consuming and fiddly, it was very, very rewarding. 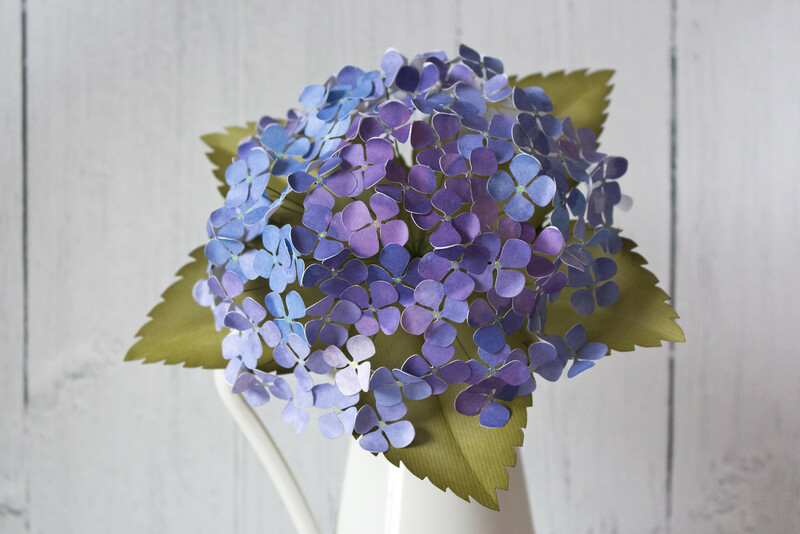 I looked up various versions of paper hydrangeas online to get a guide or starting point. Sadly, every tutorial I found was behind a paywall, and though I am not at all averse for paying for patterns and project tutorials at all, they were all parts of services that allowed access to a whole site for a month or year for a price that was too much for me to pay for the sake of something I could do myself, and I was doubtful that I would make use of any of the other projects, so this project is made up of a lot of educated guesswork and a bit of trial and error. One of the things I most love about hydrangeas is the wash of colour that each globe of flowers takes on. I think I read that it is determined by the PH level of the soil, acting like nature’s own Litmus paper. 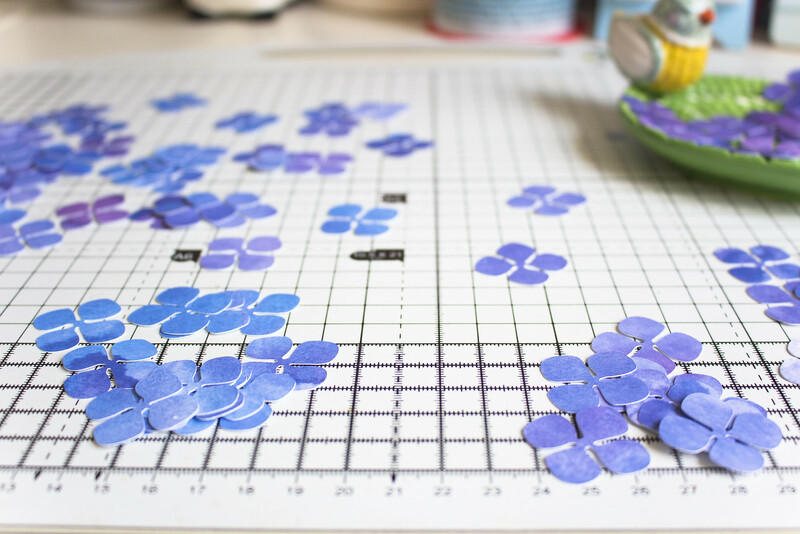 I love that way that each dome can drift in colour and intensity, and so I wanted a watercolour effect that shifted both in hue, from blue through to purple, but also in depth of colour with some paler blossoms alongside the more intensely coloured ones. 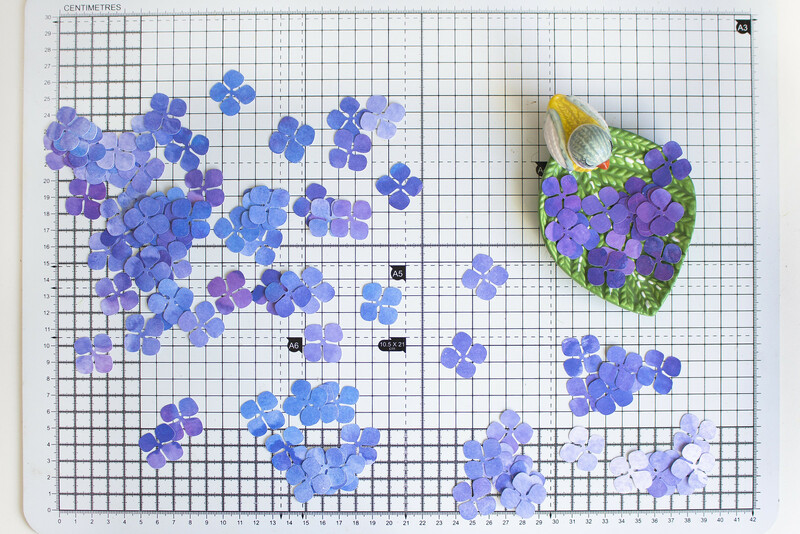 I started by cutting the watercolour sheet into 121 individual little blossom shapes of four petals. I used the Cricut machine because I cannot even imagine cutting those all by hand. Why 121? Because that’s the number that I could fit on my 30 x 30cm sheet of paper. 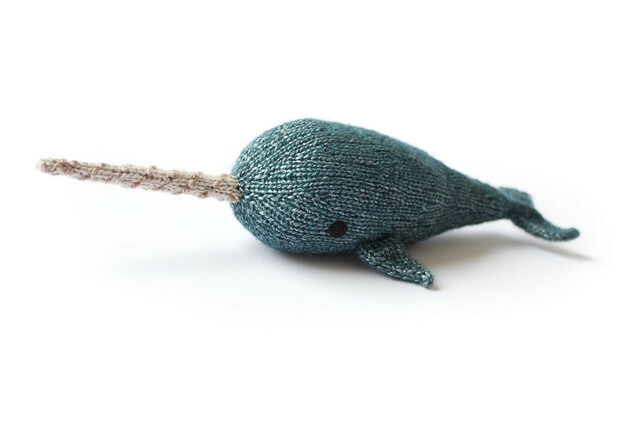 Again, there are cutfiles available for a fee, and I used one that was included with the Cricut Access one month free trial. It worked perfectly, though I scaled up each bloom until it was 2.6cm in width. The blossoms were then given a pale yellow-green centre and curled on the outside edges around the end of a fine artists paintbrush. I admit that this was a little tedious. 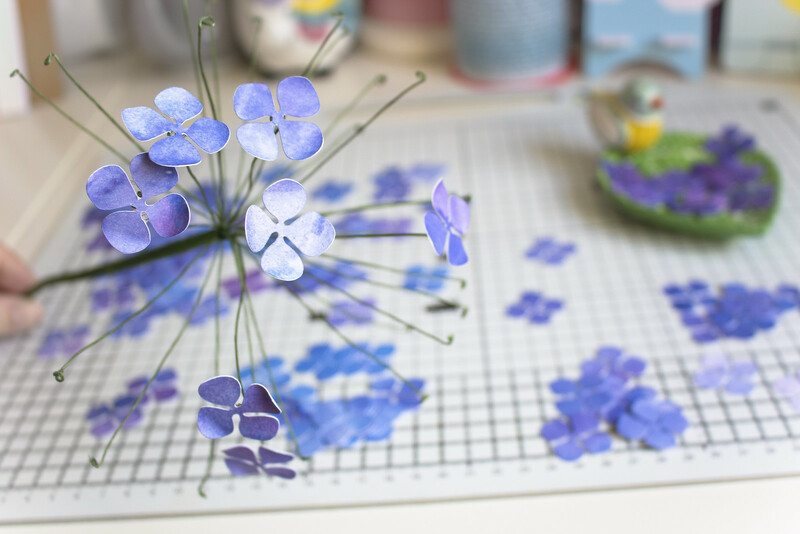 Eventually I had prepared all of my individual little flower heads (none of these are meant as technical terms, so gardeners, please forgive me – I have sadly never had a garden of my own). 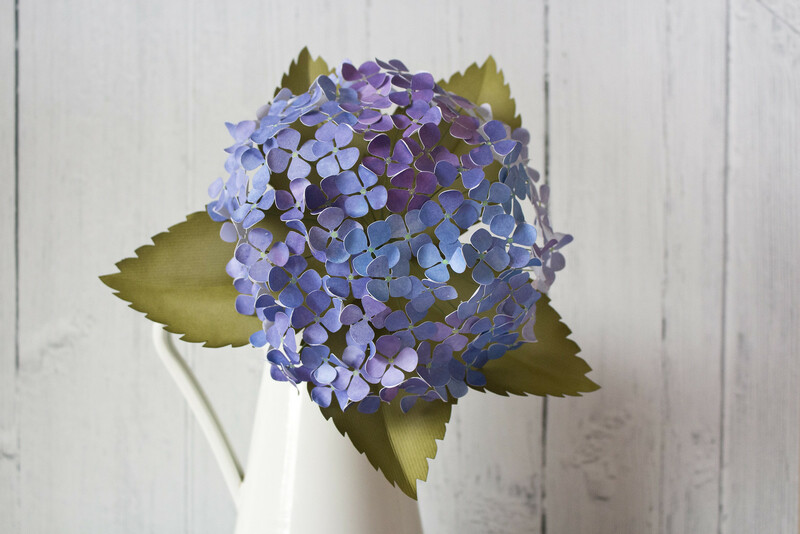 Arranging them into the familiar pillowed shape of the hydrangea involved a bunch of floral wires taped together – about 25, with the top 10cm of each wire bent out into a dome. I bent the tip of each wire into a little circle and then bent this circle out at 90º to the length of the wire, to resemble something akin to a teeny tiny metal detector. 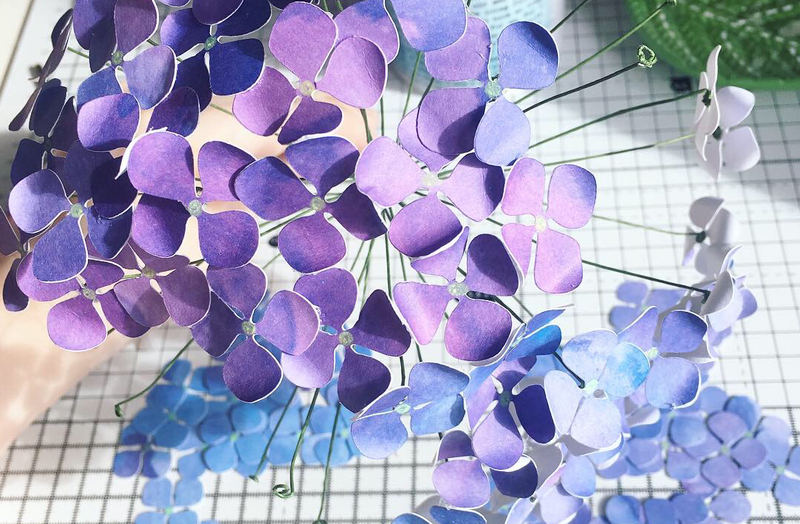 I loosely arranged the little flowers into five groups of similarly coloured paper pieces and attached six or seven of one colour group to the ends of the floral wires using UHU glue. 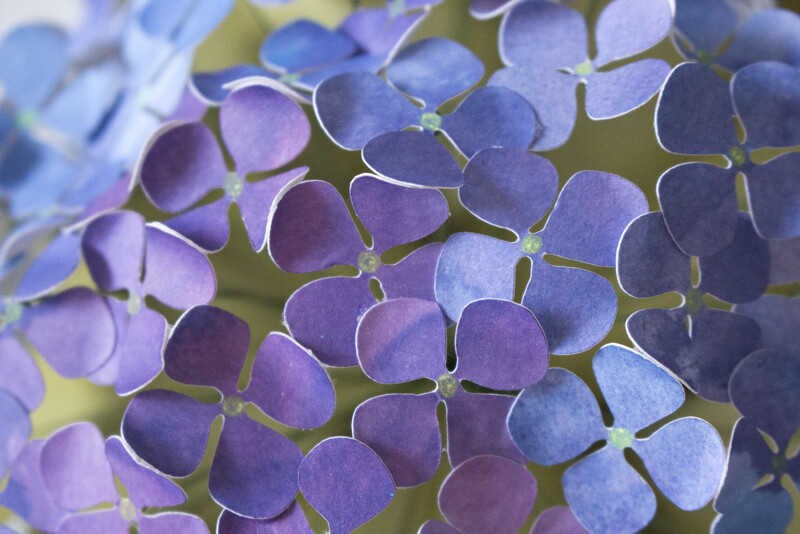 I built on this, keeping each of the colour groups of petals roughly together, so that the hydrangea had subtle but defined areas of differing hue. Some of the flowers were joined to wires, most were not. Each flower was joined to the wire structure and/or neighbouring flowers by at least 2 (but up to five) points of contact. It took a good few hours of work, but finally I got the ‘dome’ of the hydrangea finished. 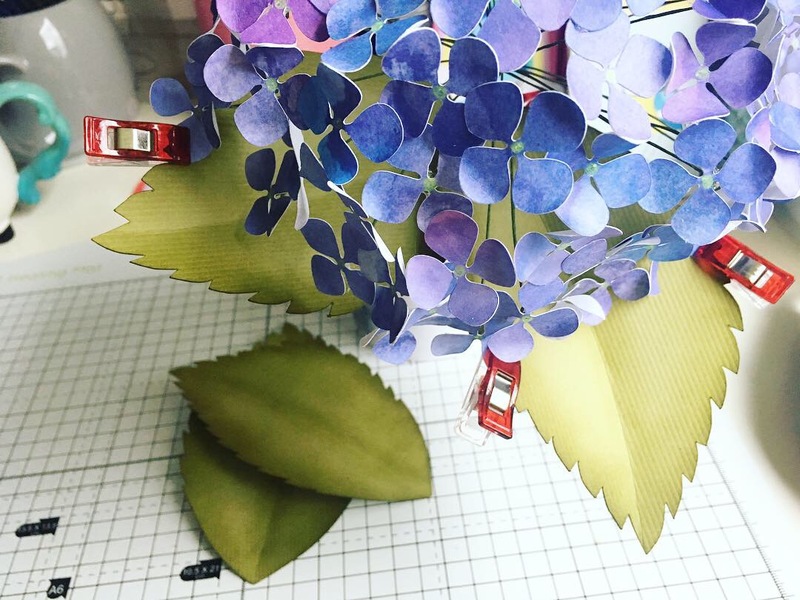 If you embark upon something like this I would recommend that one of the handiest ideas I had whilst making this was to use sewing/quilting clips to hold each of the blooms as I worked, as the glue set. 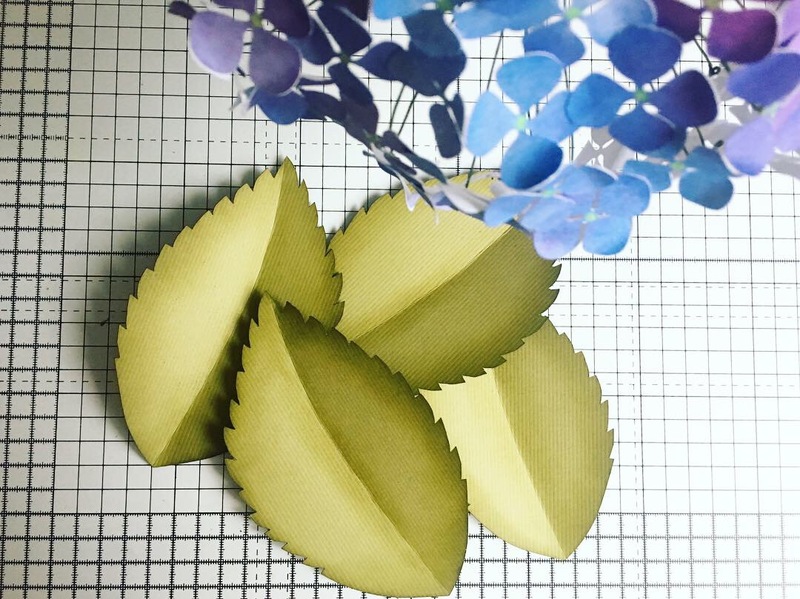 I made the leaves from a beautiful heavy piece of textured green cardstock. 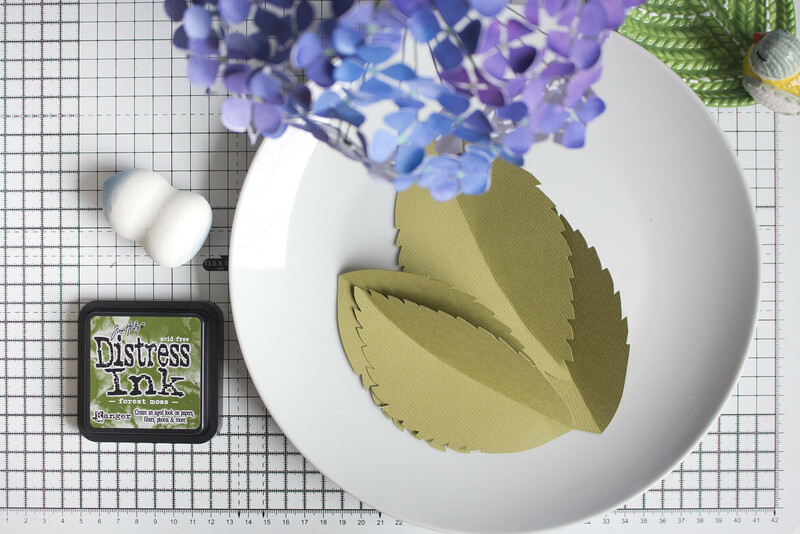 To give a bit of extra dimension to the leaves I used some ‘distress ink’ that I had from making similar leaves for flowers when I married. I used the same technique I did back then: lightly dabbing a make-up sponge into the ink pad, blotting this onto a ceramic plate, then moving the ink in small circles from the plate onto the edges of the leaves. This gave a bit of extra dimension to the leaves and I finished with a gentle link of the ink down the centre crease of the leaves. I think a similar effect could be given with artists pastels or coloured pencils blended inwards from the edge. I made five large leaves and assembled then joined them to the stem and to a few of the blooms to keep everything sturdy. And then I sat back and admired it. And I am really so very happy with how it turned out. It’s just the right size, and just the right colour, and it’s just enough. I love the way that the colours move when you approach it from different angles. From pale lilac, through purple to blue. I love the amount of air it has, making it look light, yet so substantial. And it is strongly constructed. The day after I completed it I decided that it should be for my Ma, who has cared for me all year whilst I have been ill. As we went to get into the car a strong gust of wind lifted it out of the vase and it blew straight across the car park, but it was undamaged. This hydrangea was an exercise in persistence, and patience, and in keeping in mind that everything was going to pull together in the end. And it ended up strong, and beautiful. And so I can think of no better reason to have made it than to say thanks to my ma for all the huge sacrifices she has made this year. We aren’t over it all, yet, but it’s been a great deal easier not being left alone to deal with it as a small nuclear family of three.